Previewed at: Roadshow Pictures Theatrette, Sydney, on 22 January 2018. 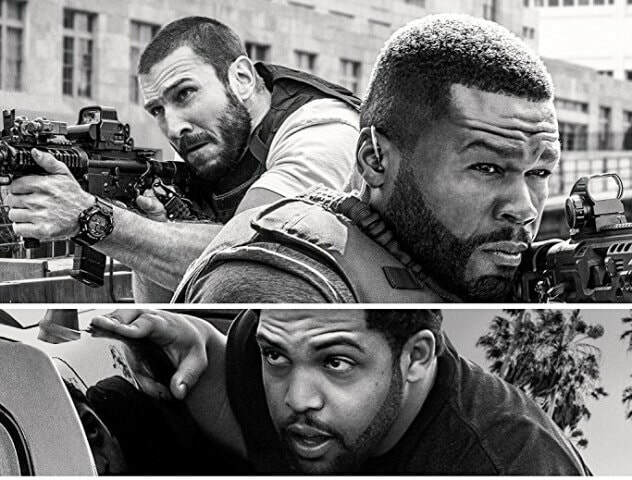 Den Of Thieves only opened in the USA on 19 January 2018 and has already grossed in excess of 20 million US, which goes to prove that ‘where there’s muck, there’s money…’ Debutant director Christian Gudegast wrote and directed this raw heist movie that provides a lot of sweat and testosterone but little else, which is a shame because there’s a good idea hidden under the ‘boys will be boys’ nonsense. Its lead actor is possibly one of the roughest men on screen, Gerard Butler, playing a cop known as ‘Big Nick’ O’Brien, who comes replete with tatts and retro leather jackets that look as if they’ve never been dry-cleaned. ‘Big Nick’ heads up a vigilante crime squad investigating a group of equally rough-and-ready crims who are planning to pull off the biggest robbery of all - the LA branch of the Federal Reserve. This particular job takes the cake as the gang plan to steal 30 million in used, untraceable banknotes before the money is sent to the shredder. Not a bad result for a few days’ work! An armoured car pulls up for a coffee stop and the guards are taken by surprise when a gang steals their vehicle, resulting in a battle that is both bloody and deafening, but the vehicle wasn’t carrying any cash. Is this a job gone wrong or something else? The case is taken on by ‘Big Nick’ and his hard-boiled crew, who have had an eye on the possible mastermind of the gang, Ray Merrimen (Pablo Schreiber), since his recent release from gaol. In his inimitable way - “You’re not the bad guys, we are!” - BN decides to kidnap one of the suspects, Donnie Wilson (O’Shea Jackson Jr., the son of rapper Ice Cube) and extracts information from him about an impending heist. As a result, the cops are ready and waiting on the day of the robbery but something doesn’t seem right. Has ‘Big Nick’ been played? Meanwhile, in a totally unnecessary sub-plot, Nick’s spouse has decided to up and leave the marital home, taking their two kids with her, after she discovers her errant husband has been having affairs when he frequents the city’s strip joints on the hunt for bad guys - quelle surprise! In fact, there are a number of scenes where the lads hang about flexing their muscles, surrounded by scantily-clad women, which are also superfluous - it’s not as if we haven’t got the picture from the beginning. These dudes are BAD! There is a young male demographic who will embrace Den Of Thieves and no doubt be interested in a cast that includes O’Shea (who’s also a musician) and rapper 50 Cent (as one of Ray’s crew), although they don’t get to strut their stuff musically. The action scenes are also highly watchable, however, as in many films of this type, a strong edit would have tightened it up enormously. It was a mistake trying to involve some back-story to the protagonists’ personal lives; these scenes are so slight they don’t really add anything except time. There’s so much going on in the central plot that Gudagast would’ve been better off concentrating on plugging some of the holes in the narrative. Perhaps the most interesting aspect of Den Of Thieves is the mutual respect the police and thieves seem to have for one another, as the gangsters are ex-military and not just hoods off the street and, let’s face it, there’s only a fine line separating these cops and the crims. According to a recent online interview, Butler said, “you see it like, these guys are great artists, great warriors and when they step onto the battlefield they’re very aware who they’re up against and they need that.” But the question has to be asked… do we?